The show day begins with Vetting In, usually between 7.00am and 8.30am. All exhibits must pass an inspection by one of the qualified Veterinary Surgeons. If an exhibit is found to be suffering from any disease it will not be permitted to enter the show hall, and must be removed from the precincts of the show. The Rule is "One out, All out" on a contagious disease, so if an exhibitor has brought along 3 exhibits to the show, and one is vetted out, that exhibitor is not permitted to bring any of the exhibits into the show. After Vetting In has taken place, time is then spent by exhibitors setting up their cats, with curtains and bases being used in all cages. Judging usally commences at 9.00am, Exhibits are evaluated by each Judge, and judged according to a written Standard for its breed. A breed standard is precise enough to allow Judges to evaluate cats accurately, yet flexible enough to leave room for differences in interpretation between judges of sharp eye and fair intention. After the completion of judging, all exhibits then remain on exhibition until 4pm, when it is then time to pack up and go home. 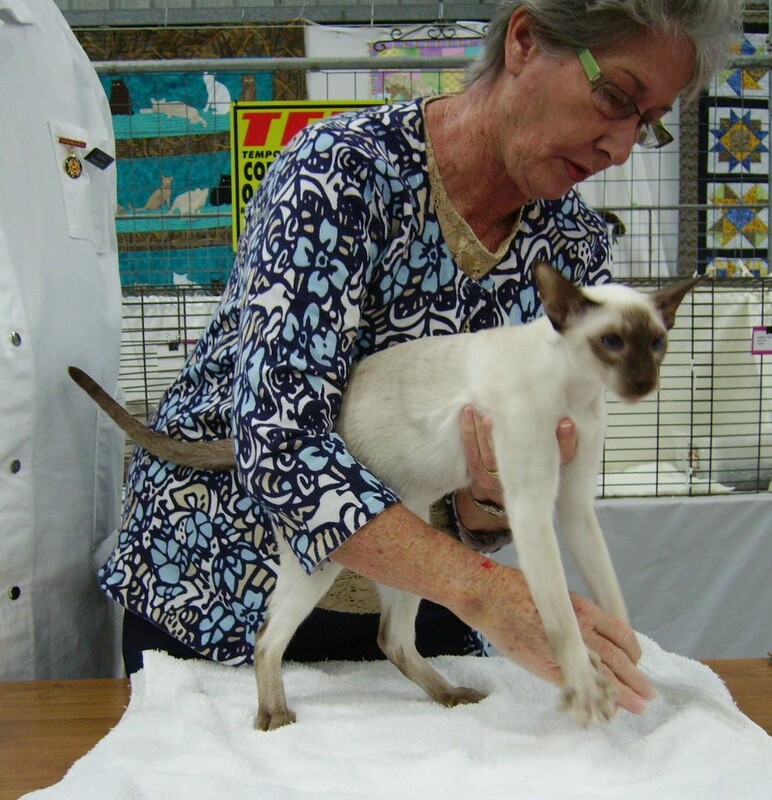 A Cat Show can be an "All Breeds Show" a "Breed Specialty Show" or a "Group Show". 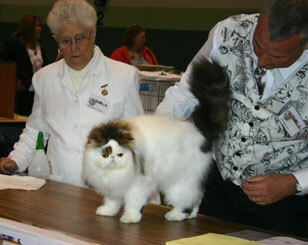 In an All Breeds Show all cats compete for various awards. 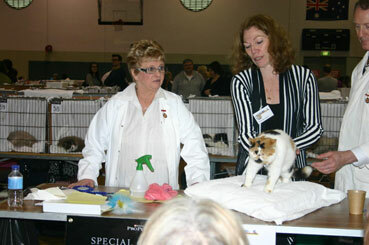 In a Specialty Breeds Show only those cats of that breed, colour and pattern compete for awards. In a Group Show, only cats of that particular group compete for awards. Shows are conducted are "Australian Open Style Show" or at rare times, a "Closed Show". At Australian Open Style Shows, the exhibits are set out in Bays, with seating provided for exhibitors and the public. The Judges move from bay to bay to complete their judging assignment, and provide a commentary on the exhibits as each one is judged. At Open Shows, the results are known as they happen. When judging commences at a Closed Show, the owners of the cats leave the hall and judges move from row to row, judging the cats assigned to them. Once judging is completed and all awards are placed on the cats' cages, exhibitors and members of the public are allowed back into the hall. The element of surprise is there as it is not until the owners return to their cats that they find out the results. Both styles of Shows can consist of multiple Rings. The Rings are run concurrently throughout the show hall, with each Ring being presided over by a different Judge. Each of the Judges present their own awards independent of the decisions of other Judges. So an exhibit which is chosen "Best in Show" by the Judge in Ring 1 may not by given the same award by the Judge in Ring 2. Your will require a secure carry cage to travel with your cats to the show. You are permitted to bring your own exhibition cage, if the Show allows. The maximum size for this is 68 cm wide 46 cm deep 61 cm high (27 x 18 x 24). Cages must be of all metal wire construction or sturdy cardboard on 3 sides with a metal wire door and top. If you are exhibiting a Kitten, you will need to have the vaccination certificate for vet-in. This must be current and for the first vaccination of a baby, it is to be given no closer than 2 weeks before a show. When you arrive at the venue, you will be given your vet-in card which will have your exhibits name and cage number on it. This is shown to the vet, along with your cats for inspection. If passed to go in, the vet slip will be signed by the vet. Then go to your cage number and set up your exhibit. If the cage is supplied by the club, it is a good idea to bring a viricide/disinfectant with you to clean it before you put your cat in side. You should have a cat litter tray with you, a bowl for water and food if necessary. It is best not to give too much food before judging as some cats can be a bit nervous. The rest is up to you! How well did you groom your cat? 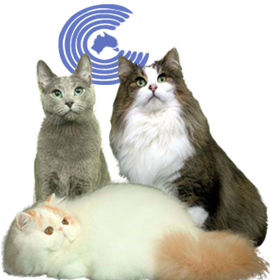 How close does your cat adhere to the breed standard? All these and more will determine how successful you are on the day.